The chances of making the playoffs for the Green Bay Packers were not very good going into Sunday’s game, the likely reality became official when they lost to the Chicago Bears 24-17 and then saw it become official when the Vikings knocked off the Miami Dolphins in Minnesota. The Bears captured the NFC North title for the first time since 2010 while the Packers missed out on the playoffs for the second straight season. It’s the first time the Packers have gone back-to-back seasons without a spot in the playoffs in 18 years. Aaron Rodgers NFL-record streak of 402 straight pass attempts without an interception came to an end in the fourth quarter when Bears safety Eddie Jackson picked off a deflected pass in the end zone. Packers upset bid falls short in L.A. The Green Bay Packers played well enough to win, but a couple of mistakes at crucial times was once again the difference between victory and defeat. The Packers had the Rams on the ropes, but the only remaining unbeaten team in the NFL stayed that way, beating the Packers 29-27 in Los Angeles. The Packers defense held the Rams offense to six points in the first half and while they let up a little in the second half, they deserved a better fate. 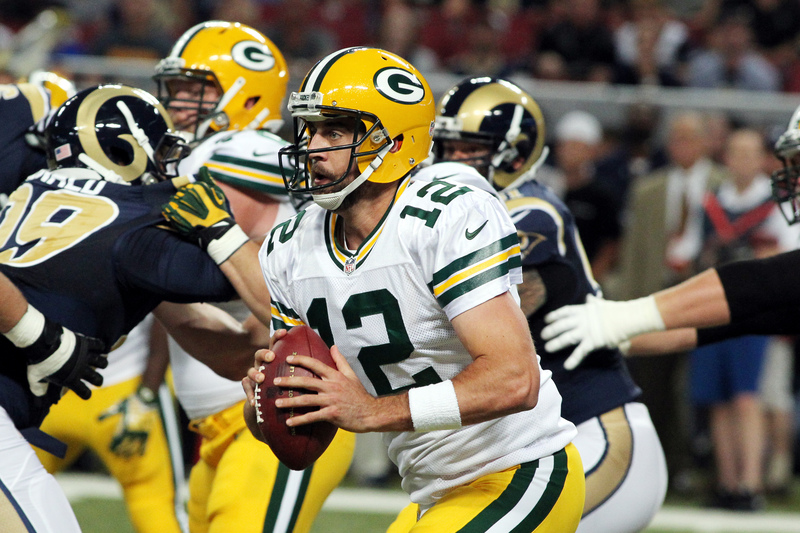 The Packers did allow the Rams to take the lead late, on a Greg Zuerlein 34-yard field goal. But Packers quarterback Aaron Rodgers was going to get the ball back with 2:05 left to play, needing only a field goal to take the lead and win. The Washington Redskins jumped out to a quick lead and held on to knock off the Green Bay Packers 31-17 in DC on Sunday. The Redskins racked up 323 yards and 28 points in the first half, taking a 28-10 lead into the locker room at halftime. The Packers defense tightened in the second half, but the offense had problems with dropped passes and penalties and never could get on track. 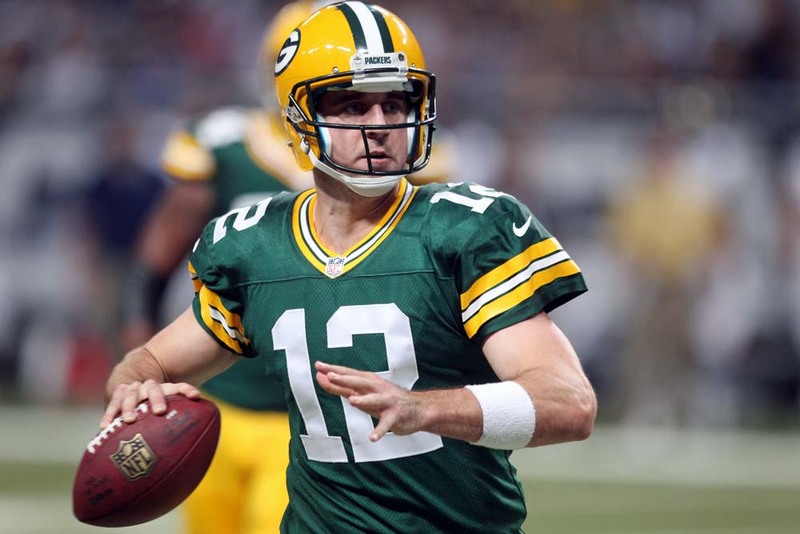 Even Aaron Rodgers struggled with his accuracy early and finished 27-44 for 265 yards and two touchdowns. Wide receiver Randall Cobb had one of his worst days as a pro, dropping two passes and fumbling. Prior to the fumble, the Packers were driving with 5 1/2 minutes left to play and a touchdown would have closed the gab to four points. The Green Bay Packers Hall of Fame announced that Davante Adams will be honored with the Hall’s Most Valuable Player award and running back Jamaal Williams will be honored with the Rookie of the Year award at the 48th Packers Hall of Fame Induction Banquet. Adams had a team leading 74 receptions for a team-high 885 yards and 10 touchdowns, and was selected to his first career Pro Bowl as an injury replacement. In his fourth year as a pro, Adams was tied for No. 2 in the NFL in TD receptions, and he has 22 receiving TD’s since 2016. Williams was selected by the Packers with the second of two fourth-round choices in the 2017 NFL Draft, becoming the first BYU running back picked by Green Bay in team history. He played in all 16 games with seven starts, seeing time on offense and special teams. 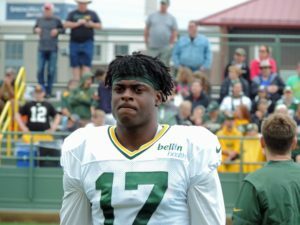 He rushed for a team-high 556 yards over the course of the season, the fourth most by a Green Bay rookie in team history. 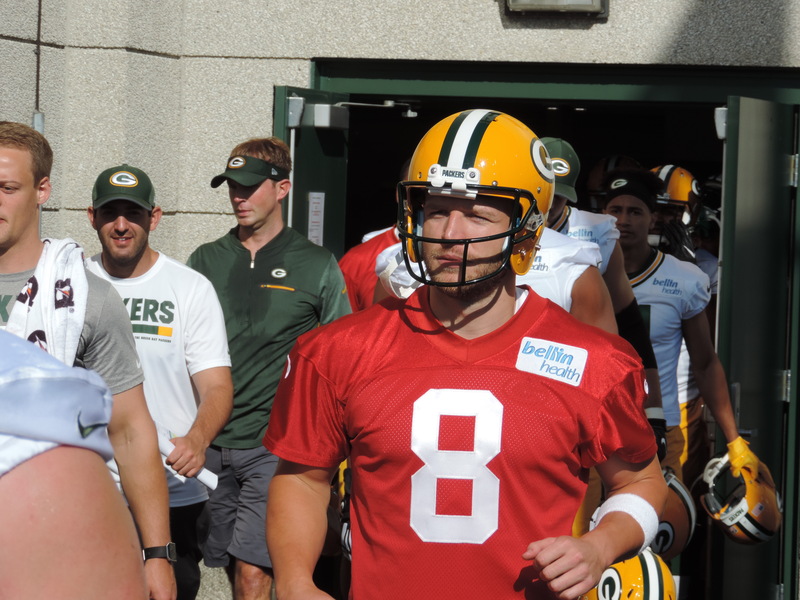 Former players Ryan Longwell and Mark Tauscher will become the newest members of the Hall at the banquet, to be held July 21st in the Lambeau Field Atrium. If Aaron Rodgers returns to the Green Bay Packers lineup this week against the Carolina Panthers, they’ll be in the position most would have hoped for when backup Brett Hundley took over eight weeks ago. 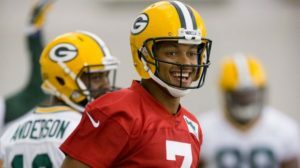 The Packers and their fans were hoping Hundley would keep the Packers in playoff contention, allowing Rodgers to return with a chance to get the Packers into the postseason. After Hundley led the Packers to another comeback win on Sunday, 27-21 over the Cleveland Browns in overtime, he admitted himself that the goal was to keep the Packers in the thick of things. He’s won three games since taking over. Hundley had his best day yet, completing 35 of 46 for 265 yards and three touchdowns. The Packers came from 21-7 down to win it. It’s a franchise record third time in one season that the Packers have rebounded to win a game after being down by 14 or more points. The Green Bay Packers stayed in the NFC playoff picture by knocking off the Tampa Bay Buccaneers 26-20 in overtime on Sunday, snapping a three-game Lambeau Field losing streak. The Packers improved to 6-6 and will face winless Cleveland on Sunday with the potential return of quarterback Aaron Rodgers for the final three games of the regular season. The Packers used a couple of big plays to help their cause. 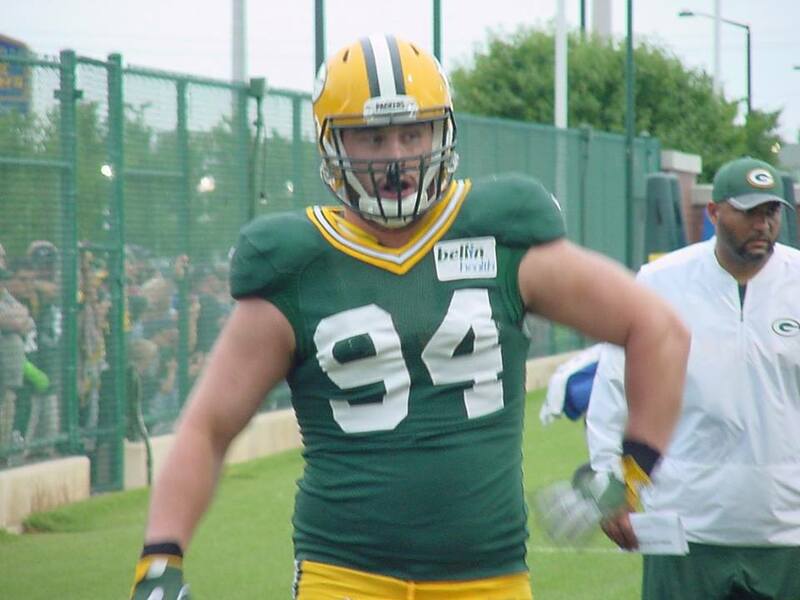 Linebacker Kyler Fackrell blocked a punt that allowed the Packers to take over at the Tampa Bay 45. Jamaal Williams later scored on a 1-yard touchdown run to give the Packers a 10-7 lead. On the very next Tampa Bay possession, Green Bay defensive tackle Kenny Clark stripped the ball from quarterback Jameis Winston and the ball was scooped up in mid-air by Dean Lowry who returned the fumble 62 yards for a touchdown and a 17-7 Packers lead. Green Bay Packers rookie running back Aaron Jones will miss multiple weeks after suffering a knee injury in Sunday’s 23-16 win over the Chicago Bears. Packers coach Mike McCarthy confirmed Jones injury as a “multiple week” injury. He’s expected to miss 3 to 6 weeks. Jones leads the Packers in rushing this season with 370 yards on 70 carries. He’s rushed for more than 100 yards twice against Dallas and New Orleans. He left the field Sunday on a cart and was ruled out shortly there after. ESPN and the NFL Network reported that Jones suffered an MCL injury. 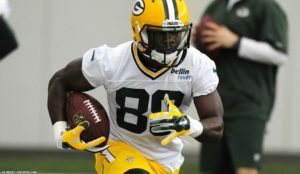 Jones was replaced by Ty Montgomery, who rushed for 54 yards on six carries, then left after aggravating a rib injury. 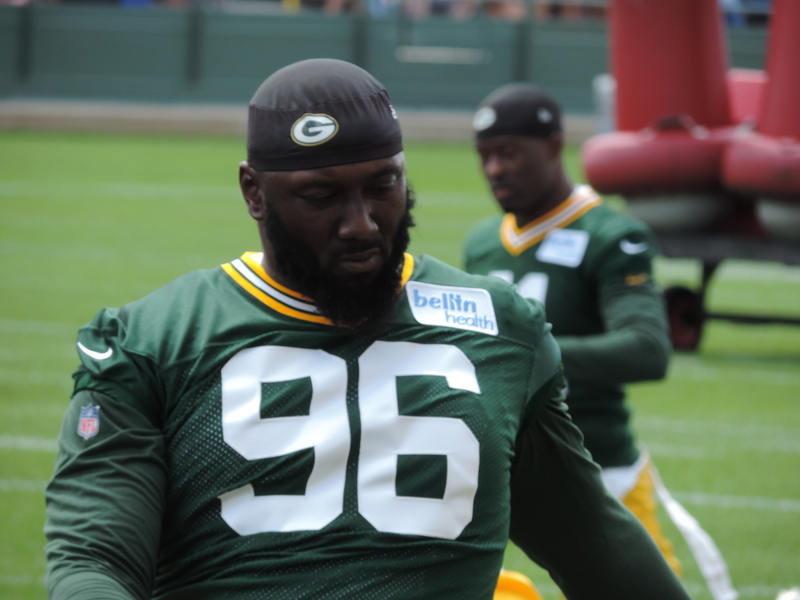 Mike McCarthy told reporters on Monday that Montgomery’s injury was not series and thought he had a chance to play this week when the Packers face the Baltimore Ravens on Sunday at Lambeau Field. Jamaal Williams took over after Jones and Montgomery left the game and rushed for 67 yards on 20 carries. Brett Hundley threw for 212 yards and a touchdown to collect his first NFL win and secure a much needed victory for Green Bay. The Packers snapped a three-game losing streak by beating the Chicago Bears 23-16 at Soldier Field on Sunday. Hundley threw a 17-yard touchdown to Davante Adams to give the Packers a 23-13 lead with 5:29 left to play and the Packers (5-4) held on for the win, beating the Bears (3-6) for the eighth time in the last nine games. The win was the first for the Packers since they last beat Dallas back on October 8. 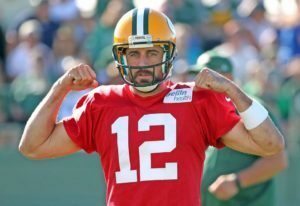 Aaron Rodgers broke his collarbone against the Vikings one week later and the Packers have been winless until Sunday. The Green Bay Packers wrapped up exhibition play with a 24-10 win over the Los Angeles Rams on Thursday night at Lambeau Field. Brett Hundley played the entire first half at quarterback, completing 11 of 21 passes for 99 yards and a touchdown. He also added a 13-yard touchdown run in the second quarter and finished with a quarterback rating of 81.2. In four preseason games, Hundley completed 48 of 76 for 482 yards, three touchdowns and one interception with two rushing touchdowns. After a first half of mostly passing, the Packers emphasized the running game in the second half. Aaron Jones led the way with 48 yards on eight carries. Jamaal Williams had 31 yards on 11 carries ad Devante Mays had 18 yards on six carries.